23a. [*Firework that doesn’t work], EVE. It’s a DUD, really, and you slide one letter further in the alphabet from D to E, and from U to V.
24a. [*Crafts site], FUTZ. ETSY, plus one. 36a. [*Contemptuous smile], TOFFS. SNEER. Toffs are, what, highfalutin folks? Yes, in Britspeak. 44a. [*Military vehicles], U-BOLT hiding TANKS. 56a. [*Resistance units], PINT, OHMS. 57a. [*Shakespearean prince], IBM. You know Arthur C. Clarke knew this when he named 2001‘s menacing computer HAL—single steps away from IBM. Lovely theme, and it’s the constructor’s crossword debut. The ETSY/FUTZ shift is a particularly nice find. Highlights in the fill: BLOODY MARY, the implausibly named Y.A. TITTLE, SCRIMPED, the London paper THE SUN, SXSW, and STYX clued as [Band with the top 10 hits “Lady” and “Babe”]. Could do without PDAS, OLEO, ENURE, OMOO, STELE. 34a. [Poet who wrote “Anxiety is the handmaiden of creativity”], ELIOT. I must be super-creative, then. 60a. [Short, for one], MARTIN. Not ELECTRICAL PROBLEM or ADJECTIVE, nope. Comedian Martin Short. 69a. [Woman’s name that sounds like two letters of the alphabet], ELSIE. Constructors! There is a new Elsie on the scene. The teen actress who stars in the new indie film, Eighth Grade, is Elsie Fisher. We wish her a long and successful career! 10d. [First, second or third person], UMP. You thought this was a grammar question, or bible trivia, but no. It’s baseball. We have one more FB next week before the annual summer vacation, and it feels to me as if Peter is determined to go out with a bang. I liked this puzzle once I figured it out. That took a long time. Was this a very hard puzzle, or should I blame the sangria and the delicious belated birthday dinner? The title holds the key to this one. We have four theme entries that appear to make no sense at all – until you look down. 37a [Managed habitat] is WILDLIEA. I got the A at the end first and was looking for TERRARIA or something like that (and yes, I know that would be plural. Did I mention the sangria?). Then I figured out the them and looked at the entry below. 40a [Turned body part?] is DEAF EAR, and FEAR turns 37a into WILDLIFE AREA. 38a [Majors on links] gave me a lot of trouble, since PGA OPENS fits. Nope. We end up with BRITISNS – BRITISH OPENS missing HOPE, which is sitting underneath in STANHOPE (41a [Light horse-drawn carriage] ). 58a [Moles] are not the burrowing animals, but the spies. I was looking for SLEEPER CELLS. It’s actually SLEEPENTS, missing RAGE to be SLEEPER AGENTS. RAGE is hiding in what may my least favorite entry in the puzzle, TUTORAGES for 61a [Instructional charges]. This is a great idea and a knotty construction challenge that suffers somewhat in the execution. SLEEPER AGENTS strikes me as a roll-your-own, and BRITISH OPENS shouldn’t be plural. I already mentioned TUTORAGES, and the fill also features the unfamiliar GUANABARA, archaic (if ever used) APER, OPPIDAN (completely new to me, and not in a good way), plural ELS for trains, and ex-Japanese PM ASO. On the plus side, at least ELS is clued without reference to Chicago. 9d [Sheet between the sheets] is DENTAL DAM. We’re not in the NYT puzzle any more, Toto. 15d [Gp. with the Hershey Bears and the Tucson Roadrunners] is the AHL, which also features the Lehigh Valley Phantoms, based in Allentown. In 28d [Eastern half of a western Texas city? ], “eastern” refers to the right side of El PASO, which is true if we stipulate that north is at the top of the page. I enjoyed the juxtaposition of 55d [Sharp feller] and 56d [Jamaican feller] for AXE and MON, respectively. 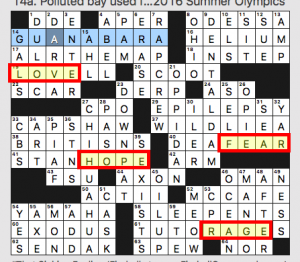 Not only is 29d WIN BY A NOSE the revealer, it also contains two words that participate in the theme. 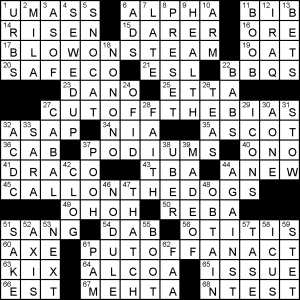 The clue is [Edge out, and a description of what appears four places in this puzzle]. Thus, we’re looking for the letter strings NOSE and WIN abutting each other. At first this struck me as an odd choice for a puzzle theme. I wasn’t sure that I cared that NOSE and WIN could be placed next to each other multiple times. But the theme grew on me, especially with the long entries NANOSECOND and LONG TIME, NO SEE. I found those entries more interesting because 1) they’re long and 2) the letter string in question is embedded within other words. DIAGNOSE, WINDY, TWIN, and to a lesser extent DRAW IN, also work for that reason. Contrarily, using the WIN and NOSE of WIN BY A NOSE as parts of two theme entries (not just as a revealer) feels a little bit like a cheat. 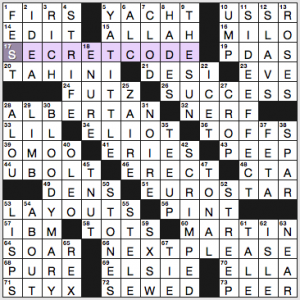 I think I would prefer that phrase to be the puzzle’s title and then be treated to another two pairings in the grid. I also would have found it more interesting if the two words in question were the same length. Having one shorter than the other feels odd. Other iffy entries: TSOS, ENTO, AT TWO, ILES, I LET, and SSR. But they’re contrasted with CLOSE IN ON, MORTGAGED, SARDINE, GOLD MINES, ICELANDER, NOT EASY, and NEOPHYTE. In the end, I’m not really sure how I feel about this puzzle. I didn’t dislike it, but I feel like it missed some opportunities. I’ll put it at 3.4 stars. 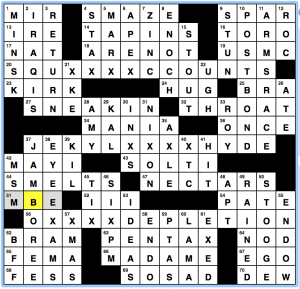 All of the territories in the theme clues have been X’d – there’s AREA in SQUARE ACCOUNTS, LAND in JEKYLL AND HYDE, and ZONE in OZONE DEPLETION. It’s a pretty straightforward theme, but it’s executed well (given all the Xs that suddenly need crossings in the grid) and sometimes you want a straightforward puzzle anyways. I’m doing office hours today in lieu of other grid thoughts – what fill did you like? what did you dislike? What didn’t you understand? An interesting theme concept – a number of idioms swap off and on, radically changing their meaning. So we have: BLOW(ON/OFF)STEAM, CUT(ON/OFF)THEBIAS, CALL(OFF/ON)THEDOGS, PUT(ON/OFF)ANACT.. This entry was posted in Daily Puzzles and tagged Alex Eaton-Salners, Brendan Emmett Quigley, Bruce Venzke, Frank Virzi, Gail Grabowski, Mike Knobler. Bookmark the permalink. Quite enjoyed the NYT. Congrats on a nice debut! FB – I liked this one a lot. I don’t know if it’s intentional, but if you trace the path of the letters from the departure point on the top line back to where it resumes, they consistently have the shape of capsized ships. Hence, “That Sinking Feeling” is doubly appropriate. My first thought on the WSJ was that WIN BY A NOSE will mean that NOSE has to appear not four times overall, including there, but it four other places. Between that and summetric placement, I wasted no end of time trying to make it fit in what turned out to be STRADDLE. So clever to interpret the phrase literally and make it fit, but still bothered me. Loved today’s BEQ — but I got a bit hung up on Main Stream Media as an acronym (thought the crossing was the old OBE, not MBE). I have a feeling we are going to see MSM alot more often in the future. God, I hope not. That was a big buzz kill in an otherwise fun puzzle. For the Fireball, I give myself the option of looking stuff up if necessary– and it was necessary for this one. A good puzzle, but with lots of things I’d never seen before. NYT – I read about IBM/HAL in “Space Odyssey” yesterday so the theme fell quickly for me. Both Kubrick and Clarke denied that HAL’s name was intentionally related to IBM. They also said that Bowman’s name wasn’t meant to be connected to Odysseus. The author suggests that maybe they were subconsciously aware of both connections. I’m enjoying the book. But I’ve been a fan of Clarke’s a long time. There is a series of British whodunnits by John Creasey in which the gentleman detective is call the Toff. Lord Peter Wimsey would also be considered a toff. 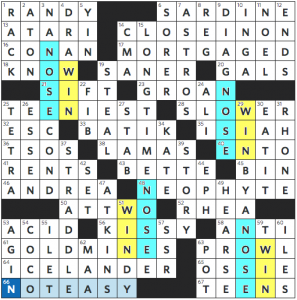 Jenni, FWIW, Emily and Henry used OPPIDAN in one of their NYT acrostics. Clued as [Of a town; townsman].